We Live In A Political World: #84 / Who Declares War? #84 / Who Declares War? This picture, of John Bolton, the president's new national security advisor, comes from an online article published by The Daily Beast. The title of the article? 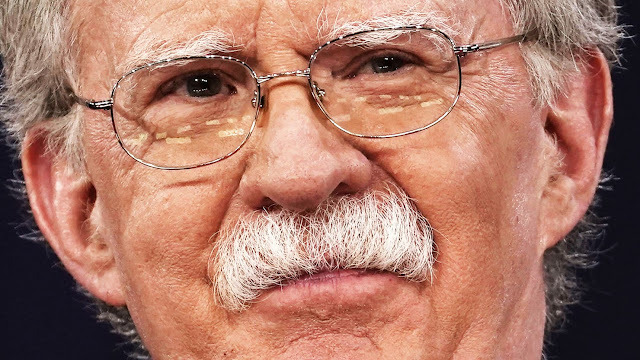 "I’ve Seen John Bolton Up Close. Yep, Be Afraid." The subtitle on the article? "Diplomacy is Surrender." The New York Times, in an editorial published on March 24, 2018, joins The Daily Beast in its expression of concern. The headline on the editorial I am talking about reads this way: "Yes, John Bolton Really Is That Dangerous." The point of both The Daily Beast article and The Times' editorial is that Bolton will now be whispering in the president's ear that the United States should be able to do whatever it wants to do, and whenever and wherever it wants to do it. If anyone suggests the opposite, Bolton is going to tell the president that he should send in the bombers and the troops to beat the hell out of them. After all, "diplomacy is surrender." Given the autocratic tendencies of our current president, advice like this will lead to no good, and will quite probably lead to war (in various places; take your pick about which is the most likely). That is what The Times and The Daily Beast are worrying about. I just completed teaching a course called "Introduction To Legal Process" at the University of California, Santa Cruz. One of our class sessions was focused on "The Law And War." I made sure that the students in the class actually read those provisions of the Constitution relating to war, and specifically Article I, Section 8, Paragraph 11. Section 8 outlines the "powers of the Congress," and Paragraph 11 makes quite clear that it is the Congress that has the power to "declare war." The president does NOT have that power. So, who or what should we really be afraid of? Where does the real danger lie? I would like to suggest that the real danger to our future is The United States Congress. If the Congress continues to abdicate its duty to determine whether or not the United States will go to war, and to let whomever sits in the Oval Office simply send out the troops, bombers, and drones at will, then our future (and the future of the entire world) is parlous, to use an infrequently visited word that means, "full of danger or risk." That danger and risk is heightened when the president believes that he has king-like powers, and that a president "reigns" instead of "serving." Unfortunately, that is our current situation. Our situation is bad, in other words, and that is not the way it is "spozed to be." Naturally, I worry about what the new Trump-Bolton connection will mean. But what am I really worried about is that our elected representatives in Congress will fail to do their job, and to carry out their Constitutional duty to act as a check and balance on the power of the Executive. If Bolton and the president want to go to war, let's have a debate. Let's put it to a vote! Mr. Bolton is certain to accelerate American alienation from its allies and the rest of the world. Congress may not be able to stop his appointment, but it should speak out against it and reassert its responsibilities under the Constitution to authorize when the nation goes to war.